Home » Vertical » Healthcare » Checkout Heathyworld.in for functional food products! CSAT360 is pleased to present its interview with Puru Gupta, co-founder, Healthyworld.in, an initiative to promote healthy lifestyle with over 2000 products from merchants including their own brand “True Elements”. Launched in April, 2015, Healthyworld is present in every online grocery store supplemented with their own outlets in Mumbai and Pune. Sreejith (Co-founder of HealthyWorld) and I wanted to work on consumer health, and due to personal tragedies at home, we were motivated to get diagnosis and preventive healthcare at the forefront of consumer mind spaces. With this social mission of driving wellness, we started healthy world. Changing dynamics, including increased awareness, rising disposable incomes and new Government guidelines, have created consumer interest in the Functional foods space. This trend, coupled with need for h ealth solutions with demonstrated efficacy, has created surged demand for nutritious food products. Lack of a National brand in this space presents a huge opportunity. HealthyWorld is a Health foods company, aiming to be the most trusted source of functional foods. It drives focus on healthier food, first by educating customers to compare and validating what they are eating (healthyworld.in) and then, driving consumption of nutritious food products (through True Elements). 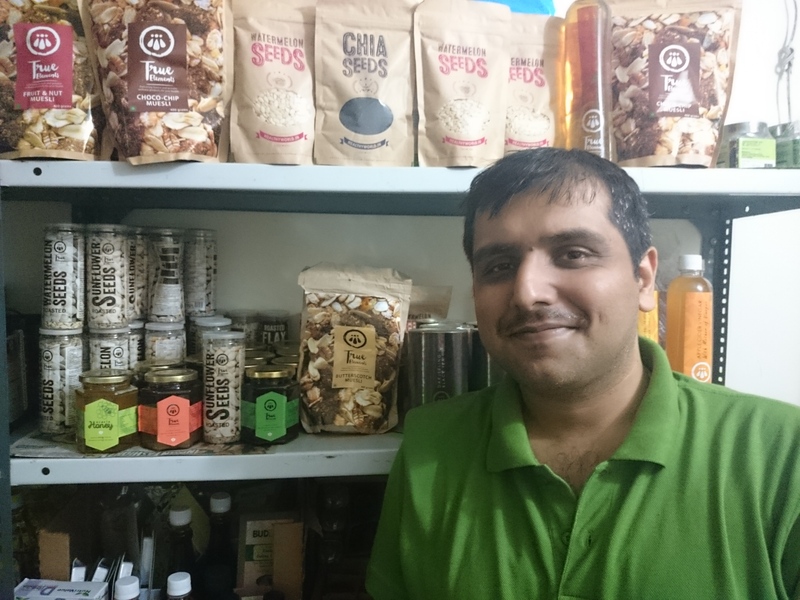 A 5-month old Indigenous functional food brand, curated from India, building a combination of traditional health foods and innovative modern consumption, driving healthy diet for urban masses. Portfolio of 30 products across Breakfast cereals, Tea, Snacks and Health Supplements. What is the system or process that you have established for customers to use HealthyWorld.in? Current Gap in the market – Customers don’t know which product is good or bad for them, and are unable to find good products. They want to take care of their health issues, but need clarity within the deluge of information available. Solution – We help customers not only validate the products by helping them compare various health foods, but also get feedback / recommendations from experts, as well as enable them to purchase the products directly. On one hand we are trying to create excitement around health, using innovations to promote healthy lifestyle with 2000 products listed on our website and on the other have we have our private label True Elements with around 30 health products created for individuals who are in search of great functional food products. We are a one stop shop for functional foods on various categories and that’s what makes us different. Eventually. people would adapt to a healthier lifestyle, even if the degree of adaptation would vary with individual mindsets. We see our role as a key influencer is enabling these choices for the customers, via innovative technological interventions. While True Elements would be present at more touch points across more cities of the world, we would continue to leverage technology to spread awareness around health foods, specifically catering to the smartphone generation! Your recommendation to other Organizations on improving customer focus? We have realized that exciting offers or deals do not ensure loyal regular customers. It’s the customer buying experience and the product quality which makes or breaks the deal. About the Interviewee: Puru Gupta is the CEO & Co-Founder of HealthyWorld, the brand that owns Healthyworld.in and True Elements. He has more than 12 years of experience across FMCG, IT & Consulting. Before HealthyWorld, Puru worked with P&G in various roles. He has specialized in Marketing from FMS, Delhi.